That's five RBIs for him tonight. Dodgers now lead with a three-run inning, nine-six. They want him to take a curtain call. He takes quick one. What a story this is! Yasiel Puig. I remember a long time ago, the New York Giants in spring training had an outfielder, and the Giants were touring in the Southwest, and the stories about that outfielder in spring training were unbelievable. And what made it really great for the writers, the outfielder was from Hondo, Texas. So of course that name captured the imagination of everybody. 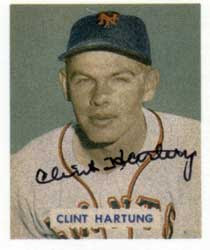 His name was Clint Hartung, and he came up with the Giants, and they just thought he was going to be the greatest thing that ever happened. He hung out for about six years with the Giants, never played more than forty some-odd games, most home runs he ever hit in a season was four. He was used as a pinch runner in that famous game when Bobby Thomson hit the home run. So, I thought of Hondo in spring training when I was reading all the reports about Puig. But Hondo never did what Puig has done tonight. 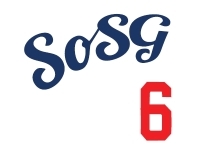 And it's nine-six Dodgers. A double and two home runs, five RBIs. If Puig is here to stay...time to play GM. What to do when everyone is healthy? Big problem is Dre's horrible contract. Since our outfield is so injury prone I wouldn't force a trade so quickly. I'm with Paul. There won't be too long of a time where all four guys are 100%. I'm guessing they work toward somehow unloading Dre in the offseason, but it's gonna cost a ton. BUT WE RICH, RIGHT? WE CAN EAT BAD CONTRACTS FO' BREAKFAST! If Ethier were actually hitting he might be worth more at the trade deadline. I also like Van Slyke who can provide power at bats from the bench. Otherwise our bench resembles the trembling power of the SOSG softball team.